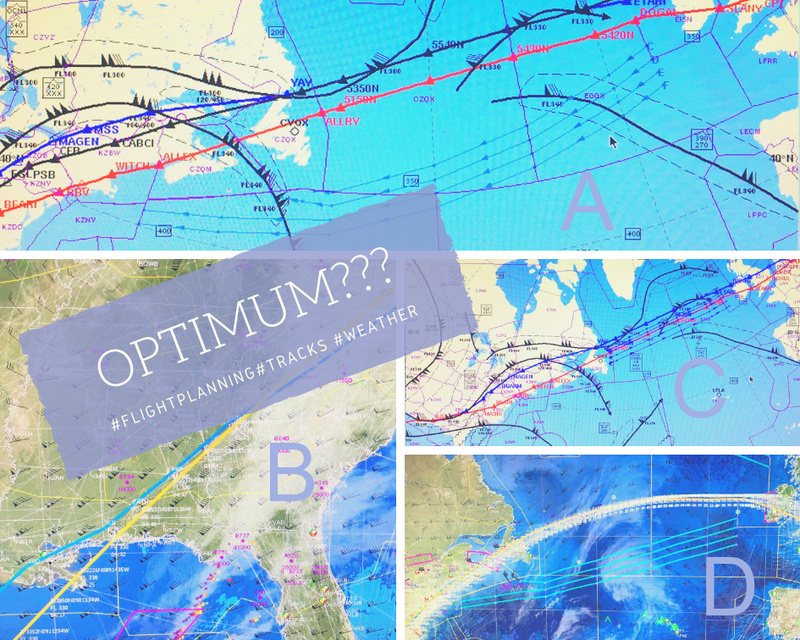 Got asked the other day why we don’t just file the shortest, optimum route for every #flight. So, 1st – there isn’t “THAT” one optimum for most flights, as many factors have to be considered: optimum cost? Flighttime? Fuel burn? And 2nd, the “shortest” one often is quite far from ANY optimum. A great example for both aspects was a MEX-FRA flight I recently planned. The shortest – and also fastest – routes were almost alike (A, blue): via New Orleans and Montreal. Pro: shortest distance, flighttime and fuel. Con: all along the jet stream, im forecast severe turbulence for hours, relatively high overflight charges. The cheapest one was via Florida (black). Con? 20 mins more flighttime and fuel, plus flying along an active cold front with thunderstorms (which my satellite images showed way more of an impact than forecast, B). Some more complication, anyone? There you go. As a reminder – NAT OTS validity is 0100-0800Z for east-, 1130-1900Z for westbound tracks. Bound to cross 030W around 1000z, I technically didn’t have to consider either track system. Practically, two things often happen doing so. 1. Reroutings aligned with the eastbound tracks, as there is still too much (delayed) #aircraft planned along these. 2. Reroutings to avoid the incoming westbound traffic (particularly if my flight was to take off with delay). Didn’t clash with the expiring eastbound tracks / traffic flows. So, I eventually matched the “fast and short” initial part with a route via Atlanta and New York area, between the worst of the turbulence and the front – plus a NAT crossing along a former eastbound track that would also clear any westbounds (A, red). All in all, this was some 15 mins longer than “optimum”, and not the cheapest either (yet cheaper than the minimum time option, and still ahead of schedule). In fact, oceanic clearance turned out as planned; and I got feedback from one #pilot on board: while theirs was still a bumpy ride from ATL to NYC, they didn’t experience the severe turb observed further west; and the could steer clear of the thunderstorms too.